“Jim Kersting: An American Dream”: reveals how one man achieved the American dream. 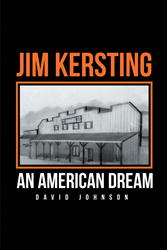 “Jim Kersting: An American Dream” is the creation of published author, David Johnson, a retired teacher who taught history and geography. Published by Christian Faith Publishing, David Johnson’s new book tells the story of a successful American Dream. Jim Kersting rose from the cornfields of Northern Indiana in the 1940s to become a successful entrepreneur in the motorcycle business. He was also the founder of the World of Motorcycles Museum. As they celebrated the fiftieth anniversary of his Harley-Davidson dealership in 2012, Jim and his family exuded pride in all they had built. His business continues to operate in the same rural location where his combination home and mechanic workshop sat just after he returned from the Army and married in the early 1960s. An American Dream is a rarity, but Jim has certainly earned the moniker through the steady application of his mechanical skills, work ethic, Christian morals, willingness to take risk, and reinvestment through the difficult early years. His close friends and family speak about his staunch reputation for honesty and integrity. Customers always testify about their satisfaction with Jim’s style of service as well as his high-quality motorcycles, parts, and products. Jim's childhood lessons, Army days, various jobs, marriage, children, business start-ups, challenges, and faith are all examined to reveal what he did to become a successful, true American Dream. View a synopsis of “Jim Kersting: An American Dream” on YouTube. Consumers can purchase “Jim Kersting: An American Dream” at traditional brick & mortar bookstores, or online at Amazon.com, Apple iTunes store, Kobo or Barnes and Noble. For additional information or inquiries about “Jim Kersting: An American Dream”, contact the Christian Faith Publishing media department at 866-554-0919.